This past few days I’ve been playing with my “new” spinning wheel; a Timbertops Lonsdale in oak, bought from a fellow Raveller at the weekend. Timbertops are renowed as the Rolls Royces of spinning wheels. That is so true. They are now made by Woodland Turnery in Wales, who have just gone into production with this model. 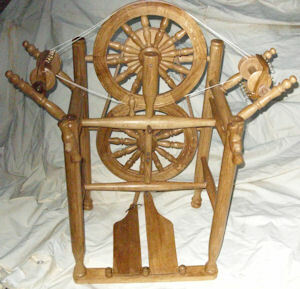 Woodland Turnery will be at Wonderwool Wales, this weekend for anyone who wants to see the current wheels. My Lonsdale is an original, and the 518th wheel made by Leicestershire Timbertops (year and the number of that wheel are stamped somewhere on the underside). If you buy or have an old TT, you can find Joan from Woodland Turnery on the Ravelry Timbertops group, and log your wheel’s number with her. 1970s’ wheels like mine are still around! I’m no stranger to a good Timbertops – in fact this is the third I have owned. When I first saw the little ad for TT wheels in the late 1980s, I wondered how good they might be, as I’d only heard of Ashfords, Haldanes, Wee Peggys and the like, upto that point. The wheels were made by James and Anne Williamson in Thurmaston, Leicestershire. My husband had grown up in the same village, and remembered when Timbertops had just made tables. So I wasn’t sure what the wheels might be like. Then I saw the brochure (I may have accidentally sent off for it, in the post….) And the wheel I fell in love with was the little upright, the Lonsdale. I learned to spin in 1983, on a Haldane Orkney upright and accidentally, like many people learning from books in the 70s and 80s, learned to spin left-handed (left hand at back, holding fibre). So I could only spin on uprights, or, theoretically, Great Wheels. At the time, Great Wheels weren’t that marvellous thing, An Object Of Desire. I liked and kept my Haldane, and was perfectly happy with it. Somehow, over the next decade, a Great Wheel did become An Object Of Desire – for living history events and also maybe after I saw that Great Wheel issue of ‘Spin-Off’. Back issues of the mag are available on CD or download, but I am not sure if that Great Wheel themed issue is yet up there… Let me know if you remember the issue number/year! Mr Williamson custom built me a wheel. He had reasonable waiting lists – just a few months – (I recall he was a little sceptical about wheel makers who have waiting lists years long, which was interesting!) and in the time it took him to build the wheel, I saved for it. Later, the Williamsons brought out the two accelerated (two drive wheel) wheels, The Beaver and the Chair wheel. (These pics are from the Woodland Turnery site, so may be their wheels, not the originals. But they look the same – although the original TTs tended to come in either oak or yew; I think Woodland use woods fairly local to their workshop so have a variety of woods available). I had a Chair wheel, in 1998, also custom built for me. And that became all the wheel I needed. By that point, I had sold the Haldane and acquired a Jensen Tina when I lived briefly in the US – and the Jensen was a wonderful wheel, but… the day I got the chair wheel, I rarely bothered with it again. So I later gave that to a friend, who I’d just taught to spin on the Great Wheel. Between them, the Chair wheel and the Great Wheel did all I wanted. I bought the Chair wheel with two flyers (have since heard some were supplied with only one – but mine came with a large and a small flyer and 4 whorl sizes). At last – a wheel that was impossible to outgrow! Anyone can spin anything they want, from the get-go, on a Timbertops – and never outpace it, even after decades of spinning experience. No need to add Heath Robinson style contraptions to it, or gadgets and gizmos – it will spin for you, whatever you want to do just how it was, the day you bought it. Any wheel that can’t do whatever you intend to do on it the day you buy it, is probably not fit for purpose. I share Norman Kennedy’s scepticism re. obsessing over ratios – a decent wheel will do what you need it to do; the only limitation being your own skill. Because I have a small (and crowded) house, I knew I needed wheels that looked good, and that I could live with – forever. Timbertops fulfilled all my criteria. Later on, I needed a less sophisticated looking Great Wheel, that would do for Living History events from 15thC onwards, so got a fantastic Great Wheel from Jack Greene the Alchemyst and sometime wheelmaker – and reluctantly sold my Timbertops GW last year, as I didn’t have space for two and the Jack Greene wheel is simply more versatile for Living History purposes. So when I got the chance to buy a Lonsdale from a fellow Raveller, I leaped at it. They are not, strictly speaking, a classical “upright” with a centrally placed flyer – suitable for both left and right handed spinners – as the flyer assembly is not central, but can be to the left or right. Mr Williamson was one of the first wheel builders in the UK offering wheels with right hand side flyers. Old treadle wheels always have the flyer on the left. Luckily, this one had the flyer on the right – although I think you can change it, yourself. Not sure. I get backache if I spin with the flyer to the left, for any period of time. Which makes anything other than an upright or right-hand side flyer wheel, a waste of time, for me. Left-handed spinning has served me well, though as it turns out all Great Wheels are only configured for it, so the left-handed spinner has a decided advantage when learning to use a spindle wheel. The Lonsdale has lived with us a few days now and already, I’ve spun some random samples of silk caps, a leftover sample of merino and two large bobbins of Wensleydale, spun worsted and plied for stockings for Living History. I have barely left the wheel alone, even though it still has a couple of problemettes to address. I sat down at it “for an hour” the day before yesterday. Six hours later…. 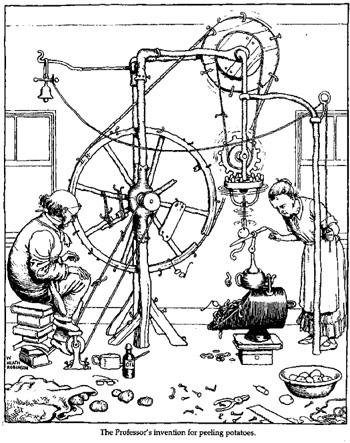 The wheel still needs a bit of fettling – once or twice, the metal rod inside the treadle bar has slid out. A wonky leg got fixed on the first day. And a bit of a clunk was solved, too. Nothing madly out of alignment, just a few bits dried out and worked loose, I think. 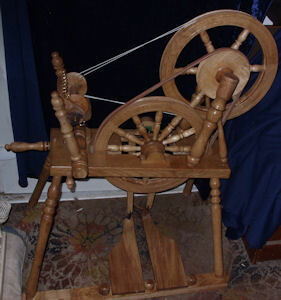 I will take it to Woodland Turnery’s wheel surgery at Woolfest, in June. Just to get its MOT. Apparently, the wheel was only bought by the previous owner last year but she never got on with it – largely because she has other wheels, including two stunning larger Timbertops – and this one, hailing from the 1970s – was in need of a bit of TLC to get it running smoothly again – and believe me, a smoothly running TT spins like a hot knife through butter – nothing else like it. Sometimes, you don’t get on with a wheel that someone else would absolutely love and I think this was the case. She said if it had been her only wheel, she’d have sorted out it’s little problems – for example, finding the tension adjustment a bit fiddly. Oddly, I don’t! There are just lots of indefinable little things that can make a wheel a bad fit for one person; and like coming home, to another. The lovely Raveller bought it from eBay – from the original owner, who bought it in the late 70s, for his daughter. The whole family had a TT and it looks like this particular daughter maybe didn’t gel with it, either. It looks like it had hardly been spun on – I suspect he had it in the attic for most of those thirty years. The bearings slightly mottled looking. Now they are lathered in gun oil and will work fine. I have spun on double treadle wheels since 1994 – first the Jensen, then the Chair wheel so I did think I was taking a punt on returning to single treadle. With DT, you’re forced to sit face-on and I don’t mind that but… to my surprise I have enjoyed the single treadle – especially when plying as you can sit in an easy chair, and have the wheel at an angle! I am finally forcing myself to stop spinning on her today, after plying the Wensleydale – just long enough to strip her down and rebuild her, as the original owner seems to have put paper under the post supporting the mother-of-all. I think things will be better aligned if I just pull the wheel off the bearings and remove all the removable parts; reverse the 1970s’ owners MacGyvering. The fellow Raveller had done some work on it already, leaving me with not too much to do. Have waxed it several times now, as some of its extremities felt a bit dried out – nothing irreversible. The wood grain is beautiful and it has quite a patina, being thirty-five years old, although my younger wheel is fumed oak, I think, and darker, as you can see from the pic below. I have had my Chair wheel for fifteen years and never got round to naming him, but this wheel is called Betty after my two great x 3 grandmas, one from Halifax, one from Huddersfield – Betty Lister (nee Crabtree), born 1793, and Betty Smith (nee Dawson), born 1804 – both women married clothiers and were the daughters of clothiers. As my wheel came from Huddersfield in the West Riding, I thought it deserved a West Riding name! The great thing about getting another TT wheel is that the flyers, although made twenty years apart, are interchangeable. That’s the 1978 flyer, bobbin and whorl on the right. See how Mr Williamson changed over from a mere six cup-hooks, to some nine brass hooks (without the shoulder, to catch the yarn – not that it does!) The lovely Raveller gave me some spare replacement brass hooks kindly supplied by Joan at Woodland Turnery – but I may stick with the clunky retro hooks, for now! 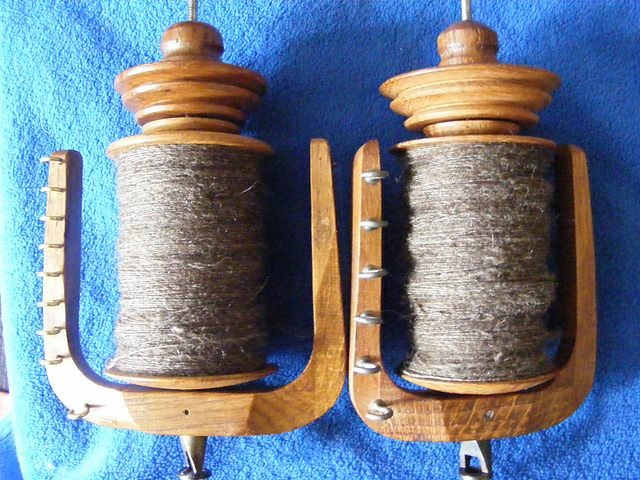 So I now have a whole new flyer, two new ratio whorls and three bobbins to switch between wheels. And the good news is, I’m hoping to offer spinning tuition/work-shops in the very near future, with Betty, at a couple of great venues here in North Yorkshire. If you’re interested in learning to spin, or learning intermediate/more advanced techniques, either in a workshop or individual tuiton – you can email me, penelopehemingwayATgmail.com for further info. How did you find the H. Orkney in comparison with the Lonsdale? The Lonsdale is much more versatile, and faster. (Although I have only had a brief spin on the Orkney, so far). And I’m not just saying that because I’m selling the Lonsdale! The wheel I bought after I originally sold the Orkney, was a Jensen Tina II upright and I no longer have that wheel, but remember thinking at the time that that was also much faster than the Orkney. Thing is, the Orkney has tonnes of sentimental value and there’s nothing wrong with it as a wheel whatsoever. In fact I am keeping it, for teaching, because it will be perfect for that. I never got to try a Lewis or any of Haldane’s older models, and I’d love to. I notice that your grandmother is a Dawson — I too have Dawson ancestry that I have had difficulty tracing. Can we connect? If you email me: penelopehemingwayATgmail.com will see what i can do but don’t know much yet as have been busy tracing Listers and Smiths!